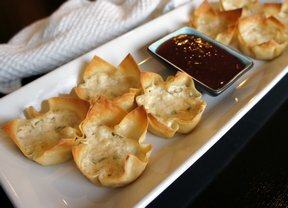 Put each wanton wrap in a muffin cup mould to make a cup shape, and bake at 400 degrees F. for about 5 - 8 minutes until crispy, be sure not to burn. Mix all the rest of the ingredients; add about 1-2 tablespoons of this mixture to each wanton cup. Put these cups on the baking tray and bake at 400 degrees F. until cheese melts. 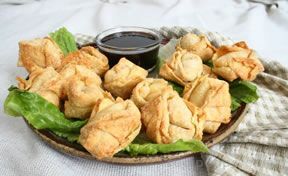 If the edges of the wantons are browning too quickly, cover with foil.